For everyone who’s getting started out online, you may find that it’s sometimes tough to get up and running. Part of the difficulty right out of the gate is deciding on a domain name for your business or website! I don’t know about you, but every time I need to come up with a team name or sign up for something, I freeze and panic coming up with something fun and catchy and one that I’ll remember. I’ve been Team Awesome 100 times already! How do I come up with a name that’s catchy, memorable and fun? 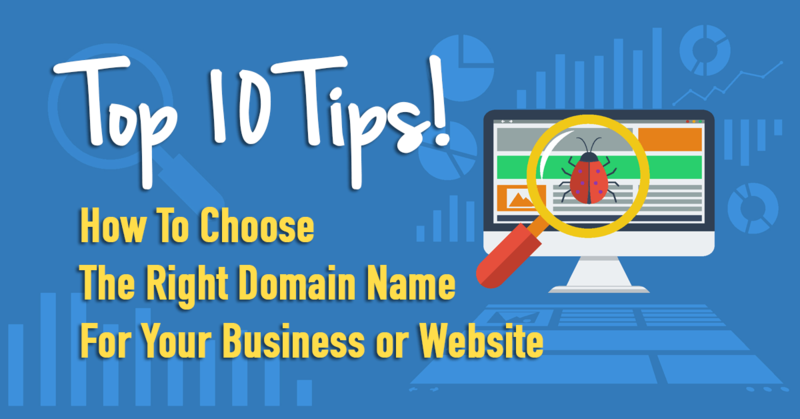 Coming up with a domain name for your website is no easy task, but with this list, we’ll get the juices flowing! We’ll also cover common mistakes to be sure to avoid! Since there is a sea of websites out there, you’ll need to find a name that’s creative and unique that isn’t already taken. Know what your core product is and what kind of website you want to be. Are you a niche market and focused only on one particular product or service or are you able to expand beyond that eventually? Brainstorm the top 5 terms or phrases that come to mind when you describe your business, product, or service. Once you have your top 5-10 keywords, you can begin playing around with them. Pair them with certain words, add prefixes and suffixes, and consider synonyms for each. For example, if you’re selling phone cases, you may consider using the words, “case, cover, protector, shell, phone, mobile, etc.” Then play with these words until you find something awesome! I would also head over to the Google Adwords Keyword Planner Tool and play with certain keywords to see which words have the most search queries in a month. This is a little more advanced, but insanely helpful when searching for keywords. We have tutorials that cover these kinds of topics over on our website! Check them out here! Be catchy, short, and memorable. Your domain name should be very simple to understand. It should be short and simple enough to remember. Be sure to not choose something too close to anything else that’s out there. Try a Google search for the keyword or keywords you have in mind and see what pops up! If there are 5 competitors just like your name and all in the order you’ve written them, then consider a synonym or something different entirely. However, if there’s simply a couple articles that use your keywords in the body somewhere, then, you’re probably set. Are you hoping to become discoverable by everyone who searches for your keywords in Google? Are you relying on traffic organically through searches? If this is the case, then you’ll want to name your domain something that answers a common search query. For example, if you’re a phone case company, you may want to consider naming your website “PhoneCaseWarehouse.com”. Or are you hoping to build a brand such as your own name or something unique? If this is the case, consider naming your website PhoneClothes.com or MobileDesigns.com. These keywords will require a different marketing approach which will include more focus on banner advertising and word of mouth marketing. If your domain name requires a high school spelling champion, then you’re off to a bad start. If your site is difficult to remember and tough to pronounce, you’ll have some troubles typing it. Avoid difficult to type letters! Some just simply aren’t able to type as well as others and have difficulty finding certain letters on a keyboard. these include “x, z, q, w, and p” This is because they aren’t typed as frequently and are more difficult to reach with certain fingers. You may find that one of your greatest marketing efforts is through word of mouth advertising. If you have difficult time pronouncing the word or phrase, you may be more easily forgotten. Be clever and unique so that you are more memorable. Just think of when you meet someone for the first time and their name is unique, but not too foreign or difficult to pronounce. When you hear them say their name, your ears perk up and have a spiked interest. Try to be memorable in this way. When someone hears your domain name for the very first time, they should be able to guess what it is that you do or offer and what type of content may be covered on your website. This goes back to the difference between your two basic strategies. You can rely on search results which are more logical and clear, or you can rely on more advertising and branding which require more explanation. I usually make it a rule to stay away from all special characters including numbers, exclamation points, and hyphens. It makes things difficult when considering word of mouth marketing. Also, using numbers may cause confusion between the roman numeral vs the spelled out number. Since your website will be timeless, you aren’t going to want to follow the latest fads or lingo in case they are obsolete or considered ridiculous in 5 years. Don’t use terms that are likely to be outdated and confusing. There was a trend that comes to mind years ago that websites were naming themselves with “AAA” before their name in order to be at the top of the phone book. This is completely obsolete now. Don’t make the same mistake! There are many tools out there that help you search through the domains that are already taken. 90% of the time you will not find that your first choice is available, however, don’t let this discourage you. With enough attempts, you’ll find something you really love that fits all these rules listed here. Although there are plenty of tools out there, these 2 are my favorite places to begin searching for available and suggested domains. Check them out! Hopefully, you’ve got some juices flowing now and can begin coming up with a unique and memorable domain name! Now that this is behind you, you’re ready to setup your website and get up and running in no time! We’ve compiled an entire database of step-by-step tutorials that guides you through the process of getting started online. These are super helpful for beginners and experienced website builders alike. Check them out at WebsitesMadeEasy.tv! It was truly informative. Your site is useful. Many thanks for sharing! I agree with all your tips! I think that there should be a mandatory review before people get their domain names. I have seen some domain names that make me put my hands on my face. Your domain name should be unique, but should also make sense and easy to spell and remember! Knowing the strategy of becoming discoverable to viewers sure would take a lot of creativity. This is something that I would have to brainstorm as my brother is working on my web page. The site would be all focused on cars and finding a domain name to make the page stand out has been somewhat tough.